Watching a Terrence Malick film is like taking a stroll through nature. Or in the case of “Days of Heaven,” harvesting it, burning it, and possibly getting killed by it. Like his other films, “Days of Heaven” moves at a slow and steady pace, with many often baffling moments. “Days of Heaven” begins in a place that can be described as the opposite of heaven, a steel-mill in early 20th century Chicago. The factory looks more like a third world country than the American Dream. After Bill (Richard Gere), a hard-working but hot-tempered worker at the mill accidentally kills his cruel boss, he flees the city with his girlfriend Abby (Brooke Adams) and his sister for the promise of a better life in the wheat fields of Texas. 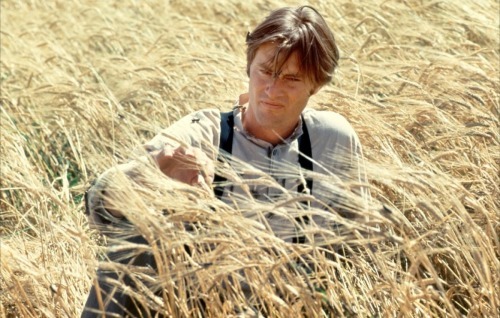 No matter how beautiful the sky looks in Texas at sunset, life in the country proves to be difficult, as the wealthy, unnamed farm owner (Sam Shepard) treats his workers like slaves. Bill convinces Abby to marry their boss in order to get a claim to his fortune. Like any get-rich-quick scheme, it ends with more blood and tears than dollars and cents. “Days of Heaven” is one cinematic story where the story barely matters as you watch it. On a first viewing, the story moves quickly and is hard to follow. That’s partly Malick’s way of telling a story and also because the story is told through the voiceover of a young girl, therefore giving the perspective of a confused child during some very dark events. While watching “Days of Heaven,” I was convinced that I wasn’t watching a linear story, but instead a detailed tour of the Texas Panhandle. Nestor Almendros received what was probably the most deserving Best Cinematography Oscar ever for his work on this film. The film is shot mostly during the time of day that he describes as the “magic hour,” which is the period of time between sunset and nightfall. During this time, the sky is an almost magical shade of light red. Maybe it shows the false, magical hopefulness of the prosperity of living off of the land. It is also a heavenly presence in the film, something Malick brings into everything he makes. Under Almendros’s photographic skills, the monotonous colors of the prairie look so vividly alive. As the stalks of wheat sway in the wind, almost in unison, it looks almost as if the fields are instead an ocean. In this film, the landscape is not the background, but rather the life that breaths through it. Some shots seem almost too good to be true. For example, how was a flower growing able to be shot in time lapse, without today’s digital technology? That question will just have to remain a part of the magical mysteries of cinema. 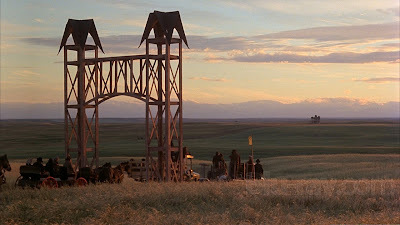 It is intentional, unsurprising, and ironic that the most humane living creatures in “Days of Heaven” are the natural elements of earth and the non-human creatures that inhabit it. The ducks, horses, bison, and many other animals that wander the ranch seem more in touch with the world than the humans there. As for the people, they are all animalistic and motivated by greed. Bill, who is supposed to be the film’s hero, has none of the qualities of the typical hero. A hero is motivated by a desire to do good and protect those other than themselves. Bill, on the other hand, is just looking out for his own well being. Even the woman he loves is just a tool to make him more powerful. Malick is purposely a very secretive director. He doesn’t want his personality getting in the way of the messages of his films. 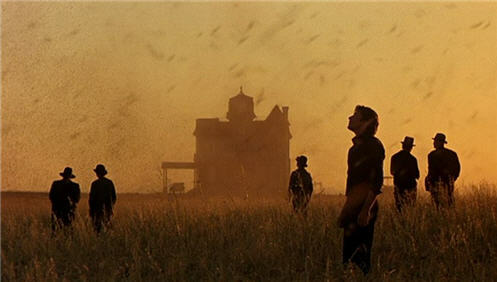 If a film is an auteur’s way of expressing himself, Malick does that through “Days of Heaven.” Malick studied philosophy at Harvard, and the actions of the characters in “Days of Heaven” probably don’t represent his moral compass but more a Hobbes like view on man: humans are violent by nature and only act in their best interest. Of all of the films ever made about the American struggle for prosperity, this is one of the finest. 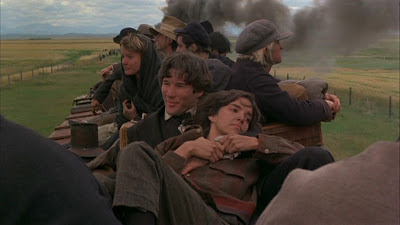 “Days of Heaven” is about both our dependence on the land, and our subsequent betrayal of it. That’s why when the locusts come and black out the sky, it feels partly like nature’s revenge but more like Manifest Destiny biting back. The downfall of most films is that their characters talk too much and have nothing good to say. Unless you’re as good of a writer as Quentin Tarantino or Woody Allen, embracing silence is a key to success. In “Days of Heaven,” Malick lets the images, along with the sweeping score by Ennio Morricone, do all of the talking. This is what makes “Days of Heaven” more than just a typical Hollywood epic. When you’re trying to tell the story of a country and its inhabitants, sometimes the best way to do so is to just observe. That way you see its beauty, and its horror, exactly as it was intended to be seen. This entry was posted in 1970s, American Dream, Days of Heaven, Ennio Morricone, Epic, Movie Review, Richard Gere, Terrence Malick, Texas on June 23, 2011 by ian0592.